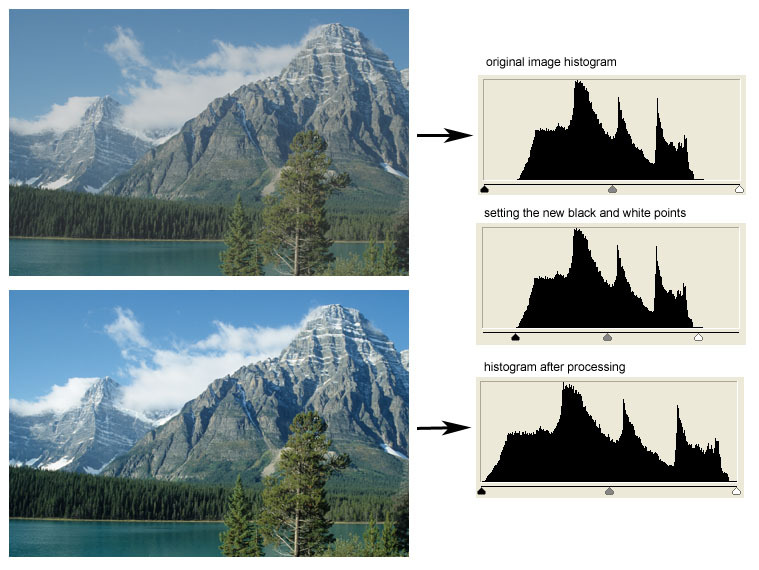 Understanding the histogram of an image is an essential precondition to master digital photography both at the time you shoot your image as well as during post-processing in your imaging application. There's no big magic behind it - the histogram is a distribution curve showing the intensity of a tone in relation to its luminosity value. 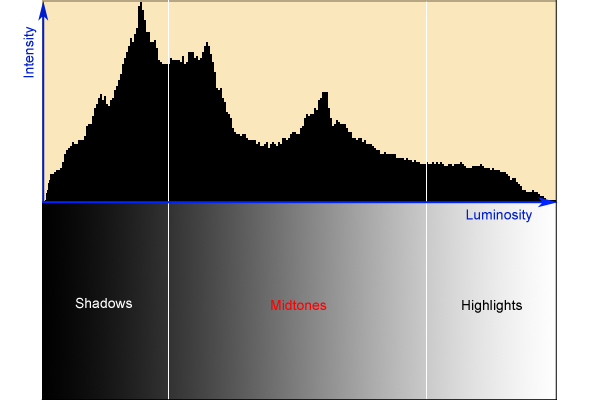 The left hand side of the histogram shows the dark tonal range usually referred to as "shadows", the center portion is covered by the "mid tones" and the right hand side shows the bright tonal range or "highlights". 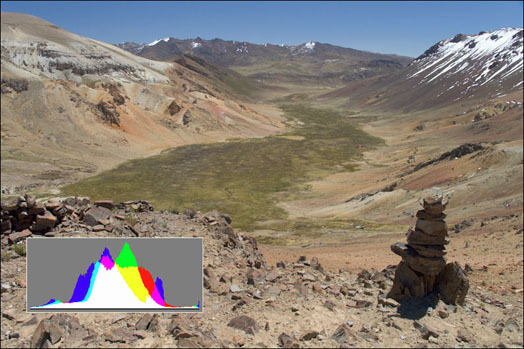 The above histogram is based on the complete RGB color space which means that it's basically an overlay curve of the 3 base color channels (Red, Green, Blue). Your camera will usually just show you the RGB representation but in your imaging application you can usually also display the histogram for the three base colors (see also the histograms shown later on this page). Your camera will always deliver images that reside completely within the luminosity range of the histogram. As a rough rule an average scene with both very dark as well as very bright portions should cover the complete range of the histogram. So if you check your histogram on location and the left or right side of the histogram is empty your image will be most likely under- over overexposed. Naturally there may be scenes that simply exceed the dynamic range of the image sensor. 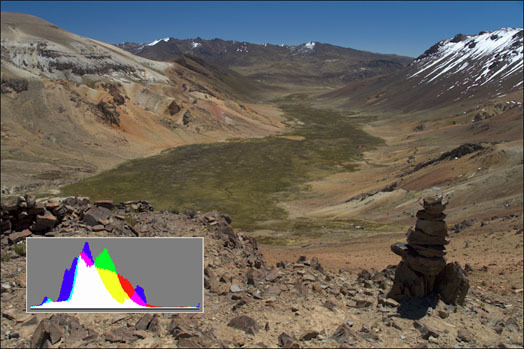 In this case you'll not be able to just touch the dark or bright end of the histogram curve but you'll hit the limits with high intensity - the result are blown out highlights if the histogram is pushed "beyond" the white point (the right-most point of the histogram) or plain black shadows if the black point (left-most point) is exceeded. The following sample shows a quite "harmonic" distribution of the histogram. Most imaging application offer you to correct your image via "auto-leveling". The auto-levels function will analyze your histogram and stretch the dark and bright points of the current image to true black and true white. Usually it performs the operation for the three base colors independently and it'll ignore any luminosity levels till a certain threshold. This works well for many scenes but it is far from being fail-safe. The histogram curve doesn't need to be harmonic or complete. If there're no highlights in the scene like in the image below the exposure is just fine. There's no need to tune the histogram to recover something that doesn't just exist. You may notice that there're several sliders below the histogram curve in the image above (taken from Photoshop here but they should be available in most advanced imaging applications). Using the upper row of (three) sliders you can control the black-, mid- and white points (left to right). The 2nd row of sliders control the output level. If you shift the black point and white pointer sliders the histogram curve will be compressed to these new values. Usually you will not need to touch these settings though. The upper row of sliders is actually pretty useful for basic corrections. If your image lacks deep black there's some empty space between the left-most edge of the histogram and the first occurrence of the histogram curve. By moving the back point towards the curve you can define a new (true) black point. Same goes for the white point slider (by shifting it to the left). Please note that the mid-point will be automatically kept just in the middle between black- and white point so if you e.g. shift the black point to the right the mid point will follow accordingly (in half steps). When moving mid point off its center position to the left or right the complete tonal range is affected. e.g. If you want the image to be brighter by shifting the mid point to the left the tonal range to the right side (towards the highlights) will be compressed whereas the tonal range to the left (towards shadows) will be stretched (and vice versa if you want your image to be darker). Sounds complicated but it isn't - just try it. You may notice that the final histogram in this sample looks a little odd. As mentioned above the imaging application had to stretch the tonal range left of the mid point thus resulting in a reduced density indicated by the "blanks" in the histogram. The range tot the right of the mid point has been compressed as indicated by the "peaks". It's quite obvious that the whole procedure isn't lossless. 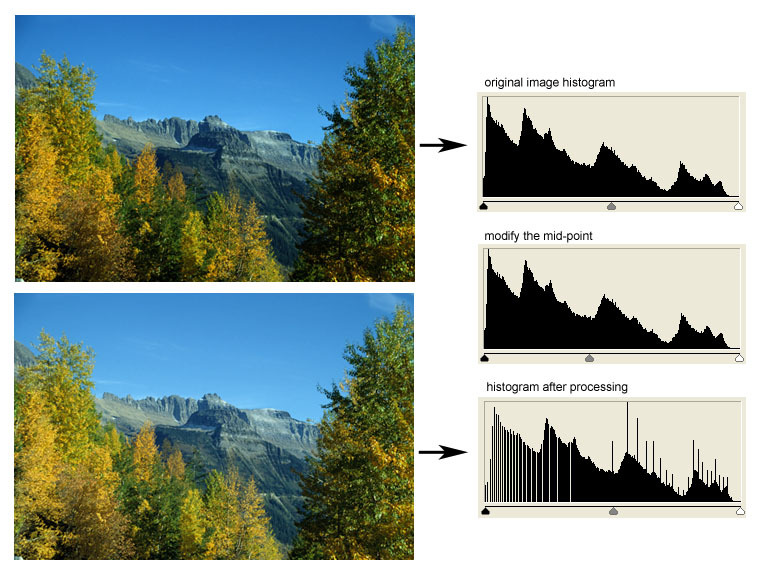 Now let's have a look regarding the effect of common image correction algorithms on the histogram. 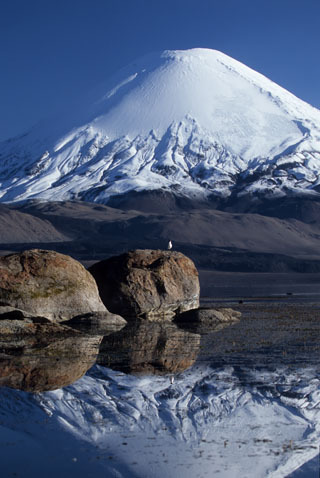 "Contrast" is the difference between two levels of luminosity. Modifying contrast can be done on a local basis (for a subset of the complete luminosity range) e.g. using the curve tool in an imaging application. However, using a standard contrast tool with a slider to increase/decrease contrast you do it on a global basis. "Global" means that contrast is changed around mid-tone gray (=50% gray). Now if you increase the global contrast of an image all pixels brighter than mid tone gray will be brightened further whereas all darker pixels will be darkened to the same degree - thus increasing the delta (contrast) of the luminosity within the image. If you move your mouse pointer into the image below the contrast will be increased (and vice versa). Now observe the effect on the histogram that is displayed to the lower left hand side. You should be able to see that the left and right hand side of the histogram gets "drawn" towards the edges reflecting the increased "delta" between bright and dark areas in the luminosity distribution. Some users may wonder about the difference between changing brightness as opposed to exposure compensation. Exposure compensation in the digital darkroom basically works the same way like on your camera - your image can take a certain range of f-stops (the dynamic range). If you over- oder under expose your image you'll shift the image luminosity across unrecoverable limits. The luminosity curve of the histogram will exceed the edges of the brightness range in this case - a "clipping" situation thus severe loss of information. 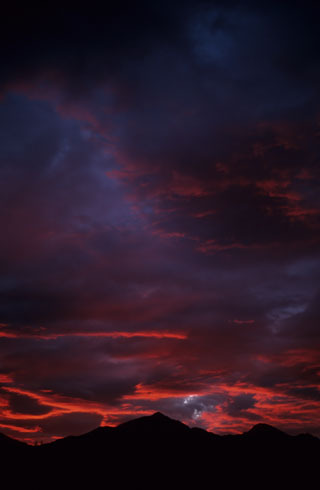 Therefore you should expose your image with a histogram that is as intact as possible = the curve remains within the limits of the luminosity range. On location (with your camera) it is often not possible to get an image with a perfect histogram simply because the dynamic range of the scene exceeds the capabilities of the camera - in this case you should decide for a correct exposure of your main subject. Using an imaging application you can simulate the exposure characteristic of your camera thus applying exposure compensation "post mortem" - with similar consequences as mentioned above. Changing image brightness in an imaging application is similar but not identical to exposure compensation. If you increase/decrease brightness you do so WITHIN the dynamic range. As a consequence you will NOT run into a clipping situation (within limits). You may notice that the difference between applied exposure compensation and increased brightness for the chosen image is marginal in this sample. The different behavior gets more obvious when pushing the image "over the edge" (by over-exposing or over-brightening) but this is really dependent on the image.